As I prepared for my recent mission trip to Honduras, I checked the State Department’s website for information. There were 3 countries with travel warnings for U.S. citizens: Chad, Syria, and Honduras. Robbery, kidnapping, and murder rates of U.S. citizens are particularly high in those countries. I had not thought of Honduras as a particularly violent country, but there were hints of the violence visible immediately on our arrival. There were armed guards at the airport – military personnel grouped in twos or threes, all carrying machine guns, patrolling the corridors. In addition, most housing and business areas looked like fortresses. Concrete walls, razor wire, barbed wire, and electric wire surrounded most of the homes and housing areas we saw. Doors were metal and windows barred. Many businesses had armed guards standing at the door. As we drove to and from a church service on Sunday, we were warned to keep the tinted windows of our van closed so locals could not see the van was full of white people. Beggars and panhandlers populated the street corners, walking into traffic seeking money. The church where we worked during the week was locked down tight, and at least one worker (and two dogs) were there 24/7 to discourage looting of the tools. You get the picture – crime is rampant, and the measures taken to keep violence out also kept people like me locked inside. Honestly, one of my initial thoughts was whether I was being protected from the people of Honduras, or if they were being protected from me. Perhaps the truth was some combination of both, and I found that sad. 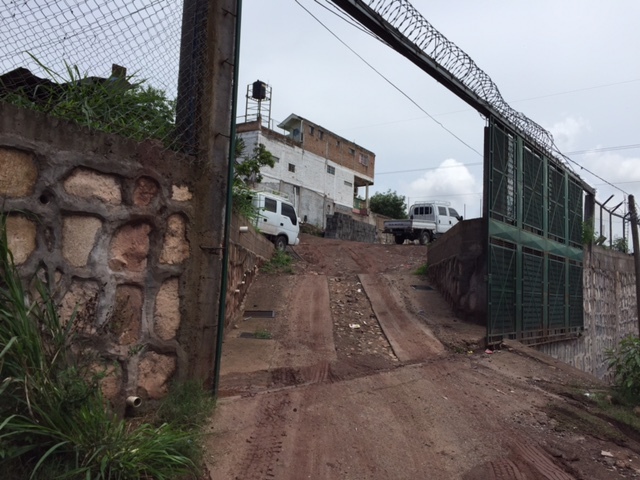 The parts of Honduras I became most familiar with – the work site and the mission house – were hardly filled with anything likely to be stolen in the United States. They were, however, valuable in Honduras – basic as they were by our standards. For a hungry person with few options, even a worn-out shovel could be traded for a meal. Our landfills are full of items that would have much utility in third-world countries. No doubt, many U.S. families throw out more food in a week than some Honduran families consume. The poverty I witnessed in Honduras led to various types of desperation. People went to great lengths to protect what little they possessed. Large numbers of people sought tips for providing various unsolicited “services” – pumping gas, carrying luggage, helping guide cars into parking spots, selling cookies or pirated CDs at restaurants. What I witnessed was the desperation of poverty, and it was a side of humanity largely foreign to me, at least to this degree. I remember the line from an old Bob Dylan song, “When you ain’t got nothin’, you ain’t got nothin’ to lose.” I think I observed the conditions that breed criminals and terrorists. I witnessed hard realities in one small area of one small, third-world country among the dozens that populate so much of our planet. I do not know the solution to poverty or the desperation it brings. I only know that having witnessed it, I can no longer not see it. Come home to church this Sunday. Pray for those caught in the desperation of poverty. Since the season of Lent, I have been practicing the spiritual discipline of silence. I am an early riser, and I begin my days sitting quietly in God’s presence. I relax and quiet my mind, which is no easy task. Random thoughts pop in and out of my head constantly. I acknowledge them and let them pass, determined not to engage in an internal dialogue with any of them. I have always considered prayer as a conversation with God, so silence is not a typical sort of prayer. Some classify the practice of silence as contemplation or meditation, although I think of those as states of focusing on something in particular. Being in silence is different, not unlike the difference between talking to a person and simply sitting in their presence. In her final days of life, I sat in the presence of my mother quite a lot. She could not communicate, nor was she conscious of her surroundings, except in brief episodes. I would talk to her, but I would quickly run out of things to say and fall into silence. In retrospect, I think I felt closer to mom during the times of silence. Talking to God, as in prayer, is a comforting and healing practice. Particularly when no one else will listen or understand, we always know we can go to God. I think, however, there is an additional level of communing with God, and that is in silence. When we are silent, when our thoughts have stopped and there are no distractions, we begin to feel the deep, loving presence of God around and in us in ways we cannot otherwise perceive it. Words cannot describe the presence of God because it is beyond words. There is no need to talk, no need to listen, no need to analyze – only to be. Clearly, I could drone on about silence and stray even farther from the core message of this Life Note; but I will not. Except to say, in keeping with the theme of letting my words be few, that Life Notes will not be published again until June 18. If you experience withdrawal, there are years of Life Notes in the archives on my website, www.ContemplatingGrace.com. Otherwise, enter the silence and be. Come home to church this Sunday. Shhhh!